It's here because you asked for it! Yes this collar is meant to be worked in. But it is not ONLY for working dogs. 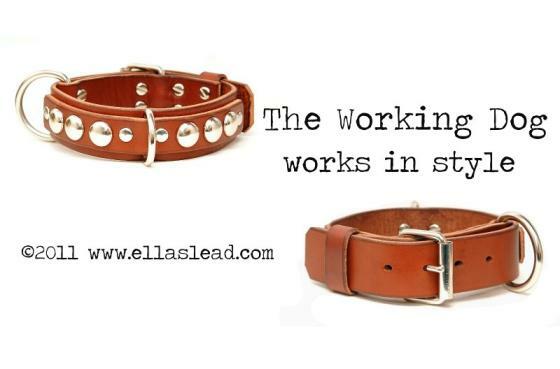 This collar is made with our strongest latigo leathers. The strap goes through the D-Ring, THEN through the buckle, and then the strap is held down by an equally thick leather strap keeper. These collar will only be offered in 1", 1.25", 1.5", and 2" with NO taper. We can offer them in a double leather collar, but limiting top strip design to only dome spots (as they easily fit through the D-Ring). 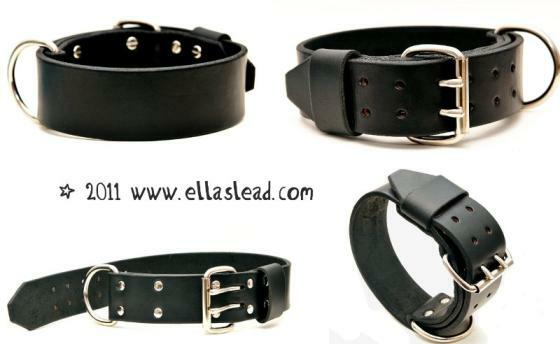 In the menu below is the option to make your collar a double leather collar, below you'll see what a double leather collar in this collar design looks like. The option to add a pattern appears as the option labeled "Yes with Decorative Spots". If you'd like dome spots on your top strip, please check that option.